Online Registration is available at bikereg.com and closes on Wednesday, October 17, at 8:00 pm EDT. No mail-in registration and no refunds. On-Site Late Registration may be available for non-UCI classes in some classes, subject to field size limits. There is a $10 same-day registration fee. The $10 same-day fee does not apply to registered racers adding an additional event on race day. All UCI racers must preregister. On-site registration and packet pick-up will open at 7:15 am on each race day. UCI Elite Men/U23 Men, UCI Elite Women/U23 Women must have a current international license. A domestic USAC license is acceptable for all other races. Annual and one-day USAC licenses may be purchased at usacycling.org and will also be for sale at registration. Only Cat 5 men and Cat 5 women can race on a one-day license. One-day licenses are available for $10 at bikereg.com or on race day. NOTE ON RACING AGE: Your cyclocross racing age is your age as of December 31, 2019 (not 2018). Riders will be staged on the grid, by bib number. All riders must be at the staging area behind the start line at least 10 minutes before their race start time to ensure orderly staging. Late riders will be staged at back of pack. UCI Elite Men and Women: Bib numbers will be assigned by UCI points, followed by random order. The top 4 pre-registered racers in the Parkway CX Trophy (Series) standings will be staged first on the grid (races 2-4). All categories may reserve four spots in the third row, which are to be used for promoters’ discretion call-ups. The DCCX course layout is approximately 3.3km long, plus an additional starting straight of approximately 100m. The total length of the start is approximately 200m and at least 6m wide, using all or part of a paved road (blue track). 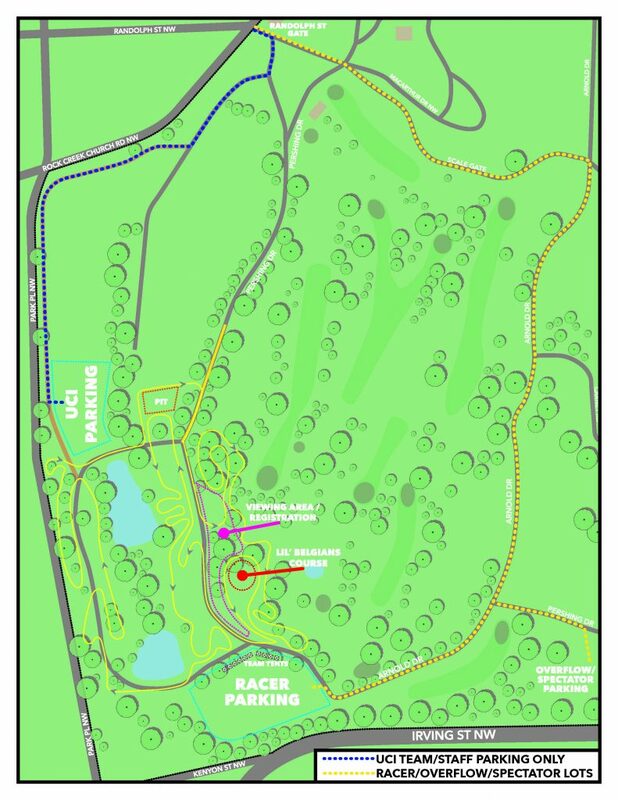 While on the start, racers pass the finish line/officials (marked with black line on map), then make a gradual turn to an uphill grass section that runs along the main venue area. Terrain is on an inclined and the track has a series of turns along with elevation changes. After passing the venue area on the uphill (right of map) side, the track enters the "W" section, a series of challenging turns on a steep hill, intersperse with one set of man-made barriers. After a road section and hilly terrain, the racers cross a road to a large, flat pit. The track returns to a hilly section that includes a short steep hills, dusty steep drop and set of stairs that compel riders to dismount, and a series of off-camber turns leading to a road to the back section of the course. After the road, there is small wooded section followed by a series of turns on grass to an extended inclined grass straightaway. In the north end of the back section, there is a series of small, steeper hills, and a couple off-camber turns leading to a slight uphill road section. This leads to the 2 nd pass thru the pit area and on to the start/finish strip (blue track on the map) to the finish line. The course will be reversed on Sunday, utilizing the same start, finish, and stairs area in the same direction, but most of the course in a reversed direction. The pit entrances and lane would be run in the non-standard direction but will feature very wide lanes to prevent problems in exchanging bikes or wheels. The course is approximately 3.2km in length and crosses over the starting straight into Pit 1 approximately 1.5km after the start. Junior races may be started in front of the cross-over for a shortened starting straight. At most 150 racers will be allowed on the course per race; for races with combined fields, the field limit applies to the combined field, not each individual race. BikeReg will close registration for each of the individual fields within a combined field after the total field limit has been reached. UCI rider sign-in, license check, and number pickup will begin at 12:15 p.m. This is a Category 2 UCI and USAC event held under UCI regulations and USAC permit 2017-2475. The event will run rain or shine. Races are held on a traditional cyclocross course with pavement, grass, hills, gravel, man-made barriers, and one double pit area. There will be no separate payout for the U23 Men and U23 Women racing in the UCI categories. Your racing age is your age on December 31, 2018 (not 2017). Racers must be 9 years of age or older, except for the “Lil’ Belgians” kids race. Two Classic Event. Four Exciting Race Days. When two races that you know and love join forces for a UCI-sanctioned four race series, you know it is going to be good! 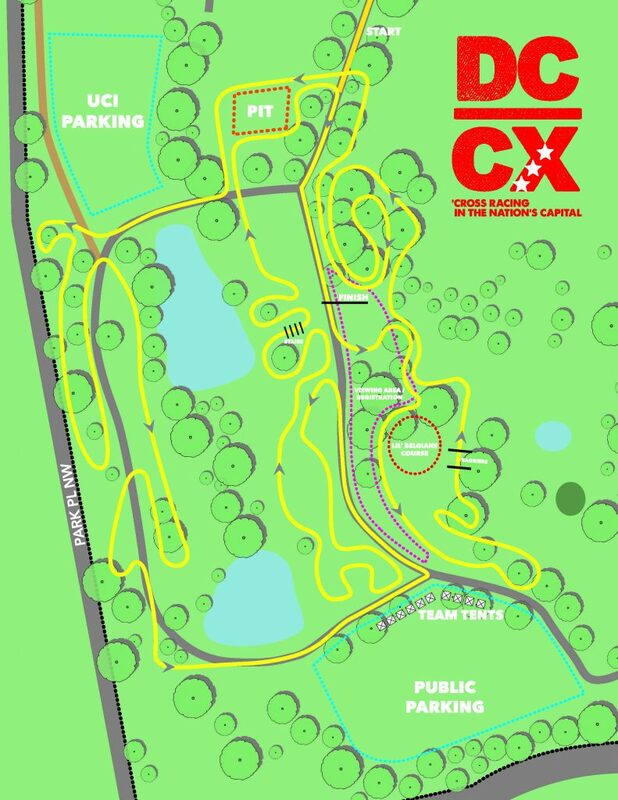 For 2018 Charm City Cross and DCCX have partnered with Union Craft Brewing of Baltimore, MD to bring you the Union Craft Brewing Parkway CX Trophy. 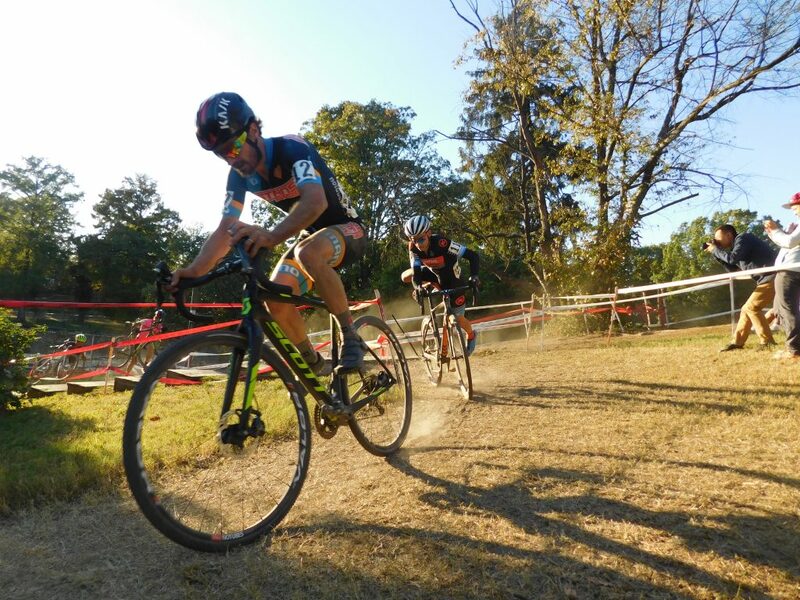 Featuring four days of racing at two classic Mid-Atlantic venues with overall standings scored on cumulative time rather than points, the Parkway CX Trophy is here to change things up! Since the series will be scored on overall time, we want to ensure that all fields know how this will be tracked. While not every field is racing for an overall leader’s jersey, each field will be scored in the same fashion. At each race, riders use the better of their actual finish time (if on lead lap) or winner’s time + 5 minutes (i.e. a rider that finishes more than 5’ after the winner, gets lapped, gets pulled, or is a DNF or DNS gets the winners time + 5’. Times are recorded to the nearest second). Bonus times deducted for podium finishers: first = 15 seconds, second = 10 seconds, third = 5 seconds. In case of a tie in cumulative time, finish order at the last race in the mini-series determines order in the series standings among those with identical times. 2nd tie-breaker, finishing order at penultimate race, etc. A leader’s jersey will be awarded after each race to be worn at the following race. The rider with the lowest cumulative time after the latest race wears the jersey (with the same tie-breaker). UCI Elite Men/U23 Men, UCI Elite Women/U23 Women must have a current international license. A domestic USAC license is acceptable for all other races. Annual and one-day USAC licenses may be purchased at usacycling.org and will also be for sale at registration. Only Cat 5 men and Cat 4 women can race on a one-day license. One-day licenses are available for $10 on race day. Riders will be staged on the starting grid by bib number. All riders must be at the staging area behind the start line at least 10 minutes before their race start time to ensure orderly staging. Late riders will be staged at back of pack. UCI Elite Men and Women: Bib numbers will be assigned by UCI points, followed by crossresults.com ranking and promoter discretion. Non-UCI categories: All day-of registrants will be staged behind pre-registered riders. All racers and spectators entering the AFRH should be prepared to show a government issued ID for entrance. Please allow extra time for entrance at the security gate and parking. Dogs are not allowed on the AFRH property and may be denied entrance. Stay on I-495 (“the Beltway”) eastbound. Take exit 31 for Silver Spring. Stay on Georgia Ave through Silver Spring. Bear left on Illinois Ave. Turn left on Randolph St. Cross Rock Creek Church Rd into the AFRH and follow signs to parking. Stay on I-495 (“the Beltway”) westbound. Take exit 27 towards Silver Spring. Merge onto New Hampshire Ave via exit 28B towards Takoma Park. Turn left on North Capitol St. Take a slight right on Rock Creek Church Rd. Enter AFRH at Randolph St and follow signs to parking. From I-395, stay on it when it ends at New York Ave. Turn right on New York Ave. Go two blocks and make a right onto M St. Go to the second traffic light and make a left on North Capitol St. Continue on North Capitol, pass the sign to the Armed Forces Retirement Home-Washington. At Allison St, make a left turn. Make another left turn onto Rock Creek Church Rd and make another left into the AFRH at Randolph St and follow signs to parking. Take Route 50, which becomes New York Ave. Take the S. Dakota exit. Continue on South Dakota and make a left on Taylor. Continue on Taylor and make a right onto North Capitol St. At the second stop light turn left on Allison St. Make another left turn onto Rock Creek Church Rd, and make another left into the AFRH at Randolph St and follow signs to parking. There are 3 lots available for parking. Please follow signs and directions of volunteers to the proper parking lot. Do not park on the side of any road or in other area of the campus. Parking and campus/event entry is free. Observe all posted speed limits. Main lot. Racer parking is adjacent to the course; follow the blue track from Randolph St.
UCI-racer parking and race officials. Adjacent to the course, closer to the pit and officials tent; follow the red track from Randolph St. Space is limited to 2 cars per racer (1 racer, 1 pit mechanic). There is a weight restriction for vehicles entering this lot. In addition to being the presenting sponsor of the Parkway CX Trophy series, Union Craft Brewing will be on-site both days of DCCX serving their Baltimore-brewed selection of beers. Founded in Baltimore in 2011, Union believes that a brewery is the union of beer, its brewers and the community it serves. Beer Unites! is not just a tagline, its the underlying philosophy of everything we believe in as a business. Good beer brings good people together for good times—and good works. This community-focused energy is why Union is a perfect match for DCCX and Mid-Atlantic cyclocross community! Trek Bikes of Arlington is proud to partner with DCCX this year as our official neutral support partner, host of our Friday evening packet pickup (featuring Acme Pie and beer from Union Craft Brewing) and live Crosshairs Radio podcast with Trek Factory CX racer Ellen Noble. Known as the choice of Telenet-Fidea, Sophie de Boer and the Trek Factory CX team, the Trek Boone is one of the finest cyclocross machines out there. Be sure to stop by the Trek Bikes of Arlington tent during the race weekend and talk with the Trek team about the line of Trek cyclocross bikes. Rapha is proud to partner with DCCX as they grow into their new home in Washington, DC’s Georgetown neighborhood. Long a purveyor of cycling culture, apparel and a meeting place for enthusiasts of all stripes, Rapha brings a new sense of excitement to DC and DCCX. Be sure to stop by their clubhouse at 3210 Grace St NW, join one of their weekly rides, or check out one of their live cyclocross broadcasts during the course of the season. Zeke’s Coffee of DC is a small batch coffee roastery in Washington DC, specializing in organic, fair trade, and sustainable Arabica beans. Zeke’s will be back at DCCX this year serving up their special DCCX race day blend, so be sure to stop by and grab a cup or a pound to take home! Also make sure to visit Zeke’s at their ALL NEW downtown coffee shop at 731 15th St NW, their roastery & coffee shop on Rhode Island Ave in the Woodridge neighborhood, or at one of the nearly 20 farmer’s markets where they serve and sell their beans! Vittoria returns as the Official Tire Sponsor of DCCX. Vittoria’s Terreno line offers a complete cyclocross tire quiver in just 3 treads. The days of needing to haul 6 wheelsets to the races are over! Terreno treads are available in five different versions; 31mm and 33mm 320tpi Corespun cotton tubular options, and 31mm, 33mm and 40mm TNT tubeless versions. Register for DCCX and get a special 20% off code to use on the Vittoria webstore so that you can check out these amazing tires for yourself! Pactimo joins forces with DCCX and Charm City CX this year as the official jersey provider for the Parkway CX Trophy series leader’s jerseys. As a huge supporter of amateur cycling in the US, and now official partner of multiple US National Champion Jeremy Powers, Pactimo knows what you need and want in technical apparel. Don’t miss out on the chance to toe the line and race for this sweet leader’s jersey! Acme Pie Co. of Arlington, VA will be back again this year serving handmade pies featuring locally-grown ingredients. In addition to being available on race days to solve that post-race hunger quandary, Acme will have pie at the ready for the Friday night packet pickup and live podcast at Trek Bikes of Arlington!